There is nobody more important to Award Emblem than you. We value your input and invite you to contact us via any of the methods below. Click here to request a current Award Emblem catalog. For your convenience, online customers can submit orders 24 hours a day through our website. Your order will be promptly processed, and you can have complete confidence in our secure server protecting your personal and confidential information. If you would prefer to discuss your order with one of our Sales Associates prior to ordering, call our Customer Service Department at 800.852.8892 and we'll be glad to help you. At Award Emblem, your complete satisfaction is our number one priority. For your convenience, you may fax your order to 800.242.0409 via our 24 hour fax service. Click here to download an order form in Adobe Acrobat Portable Document Format (.pdf). If you don't have Adobe Acrobat Reader, click here to get it. Personalization makes an award unique. There is no charge for engraving on engraveable pins or on the front of medals when used as a title choice. 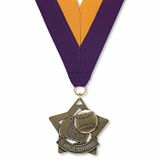 Engraving on trophies, plaques, gavels, charms and on the back of medals is 20� per character. Online customers can use the engraving form provided at the time of purchase to submit engraving copy. Many items have limitations on the maximum number of characters that can be engraved. These limitations are noted in the product description. Catalog customers, please type or legibly print all engraving copy and submit it to us via mail or our 24 hour fax service. Please check your engraving copy thoroughly before submitting your order. We can not assume responsibility for your typographical errors or for engraving copy taken over the phone. Online customers, please use the engraving form provided at the time of purchase to submit engraving copy. This form is designed to prevent you from exceeding the maximum number of characters permitted for the item you have selected. Adobe Illustrator: Convert text to outlines and save as Adobe Illustrator (.ai) or Encapsulated PostScript (.eps) file type. CorelDRAW: Convert text to curves and save as a CorelDRAW (.cdr) or Encapsulated PostScript (.eps) file type. After placing your order, you may find that you need to add additional items. While every effort will be made to accommodate your request, all orders are computer processed and we may be unable to comply with your wishes. On these occasions, any additions to an existing order will be processed as a separate order and will be shipped and invoiced separately. Production time refers to the time it takes to manufacture and assemble your order to the point where it is ready to be shipped. Please refer to the table below. When you need your order processed faster than our normal production time allows, we're here to help! For a charge of $30, we offer an upgrade to Rush Production Service that reduces normal production time by approximately 50%. Please note that production time and shipping time are different from one another, and together, determine the total time required before you receive your order. In order to meet your requirement date, even after using our Rush Production Service, you may also need to upgrade your shipping method. On these occasions, please consider using our Upgraded Shipping Services described under Shipping Information. 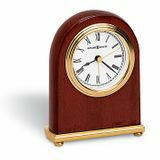 Shipping time refers to the time it takes the shipping carrier to deliver your order. Please refer to the table below. When you need your order shipped faster than our normal shipping time allows, our Upgraded Shipping Services are available for an additional charge. In order to meet your requirement date, even after using our Upgraded Shipping Services, you may also need to upgrade to our Rush Production Service. Our shipping rates are determined by your order value. Please refer to the table below. Canadian customers are responsible for all Canadian duties and taxes. Additional shipping charges may apply for orders with multiple or oversized packages. Priority Overnight by quote only. Only the United States Postal Service can deliver to a Post Office Box. FedEx and UPS require that all deliveries be made to a physical address, as they are unable to deliver to a Post Office Box. If you have a specific request, please contact our Customer Service Department, and we'll do everything we can to accommodate you. Due to the rising costs of raw materials and energy, Award Emblem may add an additional surcharge to all orders. 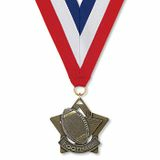 Unless otherwise shown or noted in the product description, all of our pins and medals have a rich goldtone finish. Additional finish options are described under Optional Product Configuration. Unless otherwise shown or noted in the product description, all of our enameled pins and medals have blue enamel. Additional enamel options are described under Optional Product Configuration. Unless otherwise shown or noted in the product description, all of our pins have a grip back and 5/16" tac post. Additional attachment back style options are described under Optional Product Configuration. 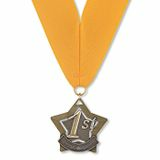 Unless otherwise shown or noted in the product description, all of our medals include a school color Ribbon Drape in the color of your choice. If ribbon color is not specified, a red, white and blue Ribbon Drape will be provided. Additional ribbon options are described under Optional Product Configuration. 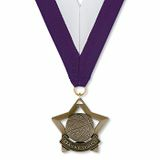 All of our pins, charms and medals include a premium presentation box at no additional charge. Plaque and trophy dimensions are approximate. We offer many choices regarding size, color, and optional attachments that will allow you to configure an item exactly as you wish. If you do not specify how you would like an item to be configured, we will ship the item as it is shown in the current catalog or on our website. 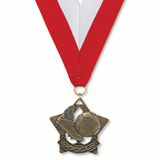 If you would like to alter the standard finish on any of our pins or medals, silvertone and bronzetone finishes are available for an additional charge of 75� per item. 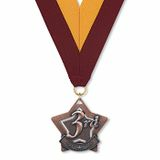 Changing the standard finish is a great way to enhance the meaning of the pins and medals you award to your students and staff. 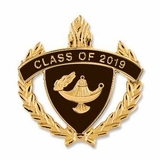 If you would like to alter the standard enamel color on any of our pins or medals, you may do so for an additional charge of 75� per item. When making your selection you can mix and match items, but there is a minimum quantity of 25 items with the same color enamel. Please refer to the table below. If you would like to alter the standard attachment back style, you may do so for an additional charge. Many of our items are equally suited for different applications simply by changing the attachment back style. Manufacturing techniques and requirements dictate which attachment back styles are suitable for the item you have selected. Please refer to the table below. Show your school colors with pride! Changing ribbon color is a great way to promote school spirit. Please refer to the table below. If you would like to alter the standard ribbon style on any of our medals, you may do so for an additional charge. 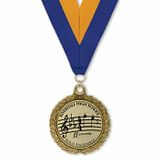 Our medals are easily suited to different applications simply by changing the ribbon style. Please refer to the table below. Public and private schools have open account privileges established automatically with a purchase order. Payment must be enclosed for personal orders and businesses that have not established a line of credit. We proudly accept MasterCard and Visa. When paying by credit card, please make sure to include the complete credit card number and expiration date. No C.O.D. orders are accepted. All orders are shipped either pre-paid or open account with prior credit approval. Invoices are computer generated in duplicate and mailed separately to the billing address we have on file. Purchase order numbers will be displayed on the package label, packing list and invoice. Terms are Net 30. Invoices not paid within 30 days are subject to an 1.5% per month finance charge (APR 18%), and open account privileges can not be extended to accounts that have past due status. There is a $25 service charge for all returned checks. Unclaimed credit balances become the property of Award Emblem after 12 months. Prices are subject to change without notice. Illinois residents who are not tax exempt will be charged 8.5% sales tax. If you are an Illinois resident and tax exempt, please provide us with a copy of your tax exemption or resale letter from the state. Please keep this in mind when visiting our showroom, as we must charge sales tax to Illinois residents if we do not have a current exemption letter on file. Please contact your State Department of Revenue for more information. We've made shopping at Award Emblem as simple and risk-free as possible. We want you to be happy with your purchase. That's why we assure your 100% satisfaction with our 100/100 Guarantee. This means that you can return any item - for any reason whatsoever - within 100 days for a prompt exchange, credit or refund. If you are not entirely happy with your purchase, you may return it. It's that simple! When you buy from Award Emblem, your complete satisfaction is our number one priority!